Add meaning to your miles! Many families have chosen to make their race experience more meaningful by RUNNING FOR A CHILD and raising funding for CASA Kane County. With every mile you run, and every dollar you raise, you are helping to improve the lives of abused and neglected children in our community. You can set up your own fundraising page today and simply donate $26.20 to CASA Kane County to launch your fundraising goal! Register for TEAM CASA : Contact Julie Hipp at julieh@casakanecounty.org or 630-232-4484. Julie will get you your entry code. 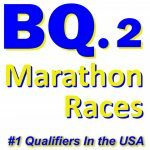 Register for the race using your code in the Discount Code blank of the registration page. Kids may run the course unaccompanied. We will have course marshals along the entire route. A parent, sibling, or guardian IS permitted to enter the starting corral, run the 1.2 miles and cross the finish line with Fox Valley Kids Marathon Participants. If a family member runs with their child during the race, they MUST COMPLETE the entire 1.2 mile course and cross the finish line. Our course marshals must ensure ALL participants stay on the course for safety. No strollers are allowed on the course to ensure the safety of all participants. Only bibbed participants will receive an official Finisher’s Medal. Kids are encouraged to wear the Fox Valley Kids Marathon Race Shirt that they received at packet pickup in the race. For the safety of the runners, the finish area along 1st St. will be restricted to runners only. Spectators will need to stay behind the barricades so that all runners can finish their race and clear the area for the hundreds of runners finishing behind them. After runners cross the finish line, they will need to continue moving north along 1st St., where they will receive their medal, then will immediately exit the restricted finish area into the north end of the Race Village. 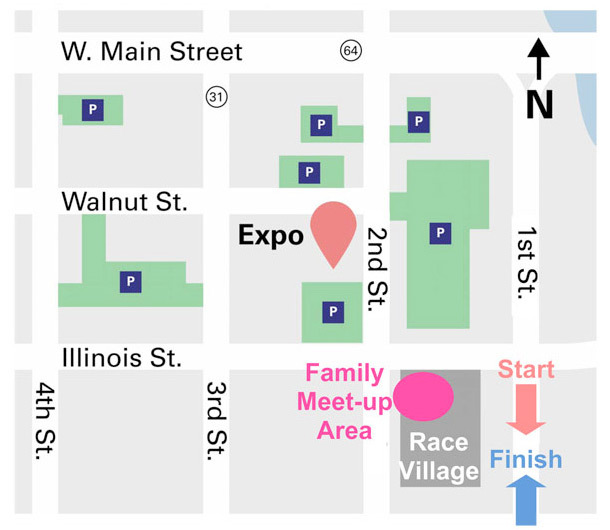 Family and spectators can meet up with their runners in the north end of the Race Village (pink area on map). Photographs of smiling runners with their medals can be taken in the Race Village. If you have further questions, please email info@fv26.com. The Fox Valley Marathon is VERY honored and pleased to announce our Sponsor, CASA KANE COUNTY. CASA Kane County is a nonprofit, volunteer organization that advocates for the best interests of abused and neglected children within the Juvenile Court system. Court Appointed Special Advocate/Guardian volunteers are ordinary people doing extraordinary things to serve over 500 children in our abuse/neglect and probate courts each year. CASA volunteers are everyday citizens appointed by judges to advocate for the safety and well-being of children who have been removed from their homes due to parental abuse and neglect. They stand up for our children and make a difference one child at a time. 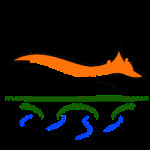 This is a program that fits in well with our philosophy at the Fox Valley Marathon. We believe that we can make a difference in a child’s health and wellness with participation in our program. 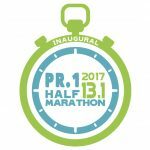 One child at a time…..and in our case…running one mile at a time to improved fitness and grow up into a healthy active adult!